His 19 points and 9 rebounds and those of Xabi López-Arosteguí (15 points) were decisive against Zaragoza who did not take advantage of the rebound. 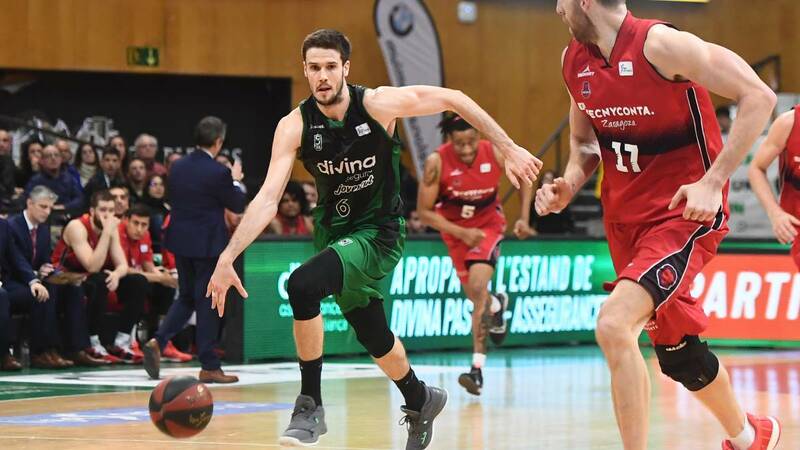 El Divina Seguros Joventut consolidates in the playoff zone after defeating tonight in the Palau Olímpic of Badalona at Tecnyconta Zaragoza by 88-73 in a clash where Marko Todorovic, with 19 points and 9 rebounds in the rival zone and Xabi López Arosteguí, with 15 points from the perimeter, were key to doble a rival who did not take advantage of his rebound (41 with 14 offensive) and committed too many errors (15 losses) . Also note the physical state of Bo McCalebb, who has only played 14 minutes, and the bad game of Nigerian Stan Okoye, with only 4 points, despite capturing 11 rebounds; two factors that weighed in excess in the Aragonese squad. There was a spirit of revenge in the Badalonese ranks for the corrective severo to which his team was subjected in the first round in Zaragoza (112-66) and eager to pay tribute to his coach Carles Duran for the 100th match in Endesa League, when on Thursday, the 8th, it was a year since his arrival to the green and bench at the beginning of the 'miracle' of the Penya. But about all this, he knew how the team would respond with the loss of Shawn Dawson, one of his key men and for whom the season is over. So the best thing was to try to get the advantage quickly and push in defense. From 5-7 (min 3) was going to a clear 21-8 (min 9) after a partial 16-1 with lethal triple Conor Morgan and Luke Harangody and unstoppable actions by Marko Todorovic in the rival zone. But the Aragonese, who did not profit from their dominance of the offensive rebound (7 in this quarter), reacted by means of the triples of the Canadian-Eritrean Jonnhy Berhanerbeskel to cut to the end of the quarter (21-16) . Con 25-18 (13 min), Duran sat Nico Laprovittola and the entrance of Nenad Dimitrijevic made Zaragoza react, especially for the actions of Nemanja Radovic in the indoor game for a partial of 4-13, going from 30-20 (min. ) to 34-33 (min.17) st basket of Bo McCalebb, taking advantage of losses badalonesas. La local reaction was immediate and with effectiveness of Xabi Lopez-Arostegui, with Todorovic in his line and Albert Ventura, he returned the He gave his rival a 12-2 run and went into halftime with 46-35. Laprovittola came back in the third quarter and Fisac placed his best outside tricks McCalebb, Okoye and Berhanemeskel with Fran Vázquez in the first previous, but the DurAn managed to go to a first maximum advantage (51-35, min. 22), the young Carlos Alocén by McCalebb, who was not in his best physical form. El Joventut maintained its advantage and Radovic and Justiz entered by Vázquez and Martí and Fisac took advantage of a television downtime to order more intensity in defense. The first points of Ronaldas Seibutis, but the Joventut achieved a new maximum advantage after triple of Laprovittola and two free throws by Marcos Delía (64-47, min 30) . The last quarter started with 64-49 and the green ones were still with two bases, Laprovittola and Dimitrijevic on track, but Ventura came through the Argentine base in the early stages (64-53, min.32) to attack the defense in the Aragonese area. Dakota Mathias broke the area with triple (67-53) , min 33), but Seibutis woke up and with a triple and a 2 + 1 left the score at 67-59 (min.33) . Fisac ordered in exchange for zone defense to individual alternative. The Joventut failed in the outside shot and his rival came closer with Radovic's triple (67-62, min.34) and Laprovittola returned to the track. Others triple Mathias opened the gap for the Catalans (71-62, min. 36) and Fisac asked time for his men to stop bleeding in the rebound by Harangody and Todorovic, which surpassed Nacho Martín in the paint. And it was Todorovic who with six points in a row extended the advantage and Laprovittola riveted the 79-63 (min 38) and from there to the end and little change, reaching the maximum local advantage to 34 seconds to the end (88-71) .